WAIST HIGH: Spandau Ballet To Reissue True And Parade. Spandau Ballet To Reissue True And Parade. Since reforming last year, and following their hugely successful Reformation Tour around Europe and the Southern Hemisphere, Spandau Ballet are once again at the pinnacle of the British music scene. 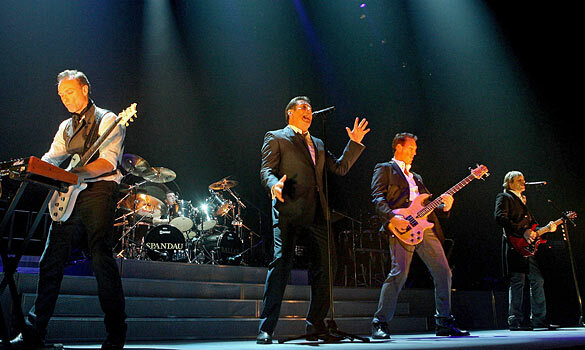 After playing to UK fans of over 120,000 people (including three nights at London's O2 Arena), releasing a new album and live DVD, Spandau Ballet will release the remastered versions of their chart topping albums True and Parade on EMI Records on June 21, 2010. Originally released in March 1983 and featuring top hits such as "Gold," "True," "Communication," and "Lifeline," True was the band's first number one album. Recorded at the legendary Compass Point Studios on Nassau in the Bahamas, it was the band's groundbreaking album of blue-eyed soul, which propelled them to international stardom and topped the charts all around the globe. Parade was originally released in July 1984, reaching number two in the UK album charts. Featuring hits and fan favourites "Highly Strung," "Round and Round," "Only When You Leave," "I'll Fly For You," and "With the Pride," the album was one of the biggest hits of the year. Alongside the remastered original album, CD1 contains five alternate mixes of singles and B sides. CD2 features a BBC In Concert show from Wembley Arena recorded in December 1984. If you missed Spandau Ballet on their spectacular sell out UK tour late in 2009 you can catch them live at their first ever festival performance this summer at the Isle of Wight Festival on Sunday, June 13, and again at the Isle of Man Bay Festival on Saturday, June 20.